Ever since Office Depot pulled their Vanilla Reloads from store shelves, we’ve been forced to find other stores that sell Vanilla Reloads and accept credit cards for gift card purchases. In Manhattan, it’s been extremely difficult as the only easy options are 7-11, Walgreens, and CVS. Of all the 7-11s I’ve visited, none of them have ever had any Vanilla Reloads in stock! Walgreens was more of the same with only one location stocking the cards (one left in stock upon my arrival). There are however four CVS stores on the walk from my apartment to my office and I’ve been checking their inventory every day. I’ve had no luck until last Monday when I found one CVS store with 2 Vanilla Reloads randomly in a pile on the customer service desk. I didn’t have my AMEX Hilton HHonors card on me (6x points) so I put the cards back next to some Macy’s and PayPal cards in the gift card rack at the very back of the store (less foot traffic). I was then out of town until this week and didn’t have much hope that they would still be there. I returned this Monday, headed to the back of the store, and was very excited to find two white cards with all those PayPal and Macy’s cards! Up to the register to pay and yet another problem, none of the computers could connect to the system to activate the cards. We tried all of the self-checkouts and the one normal register without any luck. Back to the back of the store for the Vanilla Reloads. I returned again last night and headed to self-checkout. The checkout process was actually quite simple, I had asked if I needed to go to a normal register but was informed that I could scan them myself. I scanned the first card, entered my desired amount ($500), and then was asked to confirm that the amount was correct. The assistance sign was then activated and a manager came over to confirm the details of my transaction. He didn’t even ask me for ID, though I had it out ready to show him. With one card down, I followed the same process for the second card and the manager once again was summoned by the machine to scan his card to approve the transaction. After both cards were confirmed at $500 the assistance light was activated one final time. As the manager had already seen me holding my license, he simply scanned his card and it was finally off to the payment step. I confirmed that no tax was charged (there shouldn’t be any on pre-paid gift cards) and then swiped my AMEX. One week later and I finally had my first 2 CVS issued Vanilla Reloads! With the addition of these two purchases, my Bluebird card now has a high enough balance to pay my rent this month as well! You are some of the lucky few and I envy you. I have yet to succeed in any CVS store to use a credit card. Every time clear message comes up on the register for cash or debit card with PIN. I have not been able to use a cc at Walgreens or Office Depot here in the Tulsa area. Will try CVS but I’m thinking the whole BB thing is dead for my area, which is very sad. @caveman, that’s my experience at Walgreens…yet to even find a CVS that has them.. I should stop by that location you went to one of these days. Too bad I don’t work in the city anymore so it’s going to be a 40 minute commute. Have purchased $3,000 on VR at CVS in the past 5 days! In the NYC area? That’s a great way to 1) get your cc acct closed; and 2) kill it for everyone. Be careful out there! Not in NYC. Used 5 different credit cards (just opened all of them), so should be OK.
That makes sense – running $3K through one CC at CVS in a week sounded ambitious. Yet to find a VR in NYC sold anywhere other than a cvs and anytime I’ve found a place that sells them they are sold out. Just curious – what reason would they need to ask for ID? @Jon – Most stores require an ID when purchasing a prepaid gift card with a credit card in order to prevent fraud. I travel quite a bit and made it a point to visit OD stores (prior to their removal) and never had any luck. Since we don’t have OD in Arizona, I went to the next best thing…CVS using my Hilton AMEX card. I’ve been buying between $3K-$5K for months now without a problem (limited to $1K per credit card swipe), but now all the CVS stores are sold out as well. 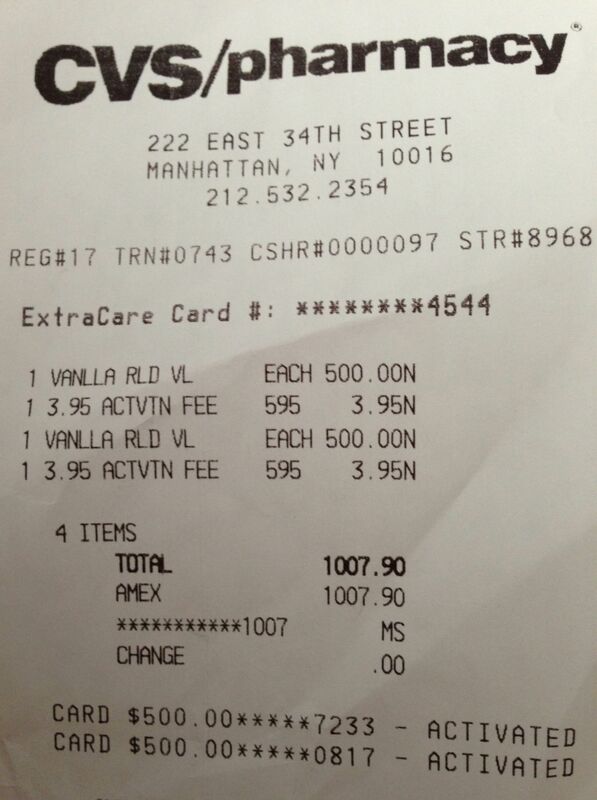 Walgreen’s has a ton of cards, but their system will not allow more than $500/transaction and most mgrs. will not allow multiple transactions. When you said there are 4 CVS in your way to work, I instantly thought about the 1st Ave, 23rd and 34th street – i live in the area too…but don’t worry don’t have those cards that give 2x or 6x points, so it’s all yours! Question, how do you pay your rent with the Bluebird card? @DJ haha yep and one more (don’t worry the 34th street CVS is the only one I’ve ever seen a reload at). Anyway, Bluebird allows you to make bill payments using the balance on your card, they send a check in the mail for you. You can therefore pay for expenses that normally wouldn’t accept credit cards, including a mortgage or rental payment. I live in MA and have found a Walgreens and a CVS that both let me buy VR cards with a CC. I have also tried several other CVS and Walgreens that either don’t have the cards or won’t take a CC. I have paid my mortgage with them, as well as a couple of bills. I only loaded $3,000 last month, to work on a 5K minimum spend for a new CC. And, so far I am 1/2 way through picking up the max of $5k for the month, that BB allows. I am also using the HHonors Amex, and just got the 6X points on my statement, for the purchase I put on that card last month.